Manufacturer of a wide range of products which include tantalum thermowell sleeves, thermowell sleeve, tantalum thermowell sheaths, thermowell sleeves, tantalum protechtive sleeves and tantalum thermowells. 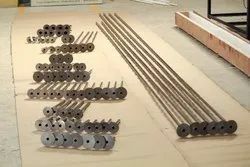 Uniforce Engineers specializes in supplying seamless Tantalum Sleeves and Sheaths with a variety of diameters and thicknesses Our Tantalum Sleeves /sheaths are fabricated from Seamless tube with one end closed and RF stub on the other end to suit ANSI B.16.5 standrards. Tantalum Sleeves for RTDs. 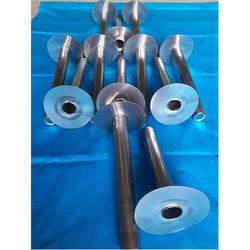 Tantalum sleeves are generally fabricated from Made from 0.4mm WT seamless tubes conforming to ASTM B521. All sleeves are offered with raised face in accordance with ANSI B 16.5 and one end cloased. 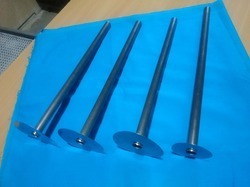 Sleeves are also available in 0.8mm/1mm thk. One of the most economical solutions to protect the thermowells from chemically aggressive fluids is to provide a bar-stock flanged thermowell made out of conventional stainless steel with loose lining in the form of a Tantalum sleeve on the entire wetted portion. This will provide strength from stainless steel corrosion resistance from the lining. One of the most economical solutions to protect the thermowells from chemically agressive fluids is to provide a bar-stock flanged thermowell made out of conventional stainless steel with loose lining in the form of a tantalum sleeve on the entire wetted portion. This will provide strength from stainless steel & corrosion resistance from the lining. Flanged 1" (DN25) to 3" (DN80) as per ANSI or DIN as standard. Other thicknesses can be provided on request. UNIFORCE is pioneer is supplying Tantalum protection to Thermowell/Thermocouple and RTD sensor manufacturers as OEM product. The protective sheaths are made of Commercially Pure Grade tantalum which has excellent corossion resistance towards strong medium at elevated temperatures. UNIFORCE specializes in manufacturing and supplying seamless Tantalum Sleeves and Sheaths in numerous sizes and wall thicknesses according to customer requirement. 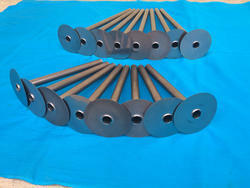 Custommachined shapes Tantalum Threaded Theromwells are also supplied by request. Tantalum Thermowell / Sleeves are designed to meet standards established by BSI, DIN, ASME, ISO 9001 and other authorities. 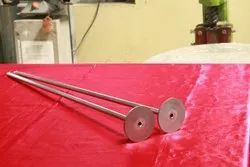 The most economical way to protect the thermowells from chemically agressive fluids is to provide a bar-stock flanged thermowell made out of conventional stainless steel with loose lining in the form of a sleeve on the entire wetted portion. This will provide strength from stainless steel & corrosion resistance from the lining. Uniforce offer a wide of range of themowell sleeves in thicknesses 0.4mm/0.8mm/1mm in accordance with ANSI standards for RF portio at any Insertion Length as required. UNIFORCE manufactures TANTALUM protection sheath for corrosive applications from R05200. Upon receipt of following DATA our engineers will prepare quotation. RF Dia, Immersion length, OD and ID in mm. One of the most economical method to protect the thermowells from chemically agressive fluids. 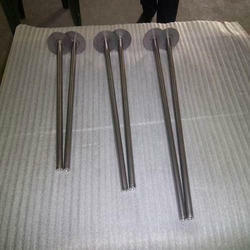 Bar-stock flanged thermowell made out of conventional stainless steel with loose lining in the form of a Tantalum sleeve on the entire wetted portion eliminates corrosion from the strongest acids like sulfuric acid (H2SO4), hydrochloric acid (HCl), nitric acid, acetic acid and other strong corrosive acids and aggressive chemicals.